Cutting to the chase: it has been dumping in certain regions of the alps. Ruhpolding, Germany, site of this week’s International Biathlon Union (IBU) World Cup’s has been no exception. The men’s 10-kilometer sprint that went off today under clear skies had been postponed, it was scheduled to run Wednesday. Race officials postponed the race due to a weather related (read heavy snowfall) state of emergency in the district of Traunstein, where Ruhpolding is located. With a bit more rest in their legs, Norway’s Bø went one and two in the results. The younger of the brothers, twenty-five-year-old Johannes Thingnes Bø won in a time of 22:56.3 minutes after skiing a single penalty lap. Johannes Bø cleaned his prone stage, while missing one target while standing. The elder Bø, thirty-year-old Tarjei Bø placed second (+7.9) after cleaning both shooting stages. It was Tarjei’s second individual podium of the season. Benedikt Doll of Germany was third (+10.5), with one penalty while standing. France’s perennial biathlon star Martin Fourcade was fourth (+15.9) with no penalties. Sean Doherty of the U.S. was the best placed North American in 23rd (+1:10.2, 1+0). As of late, Doherty has been racing consistently in the top-30. Also for the U.S., Jake Brown shot clean to finish 47th, 1:40.8 minutes back. Leif Nordgren placed 50th (+1:45.3, 0+0), and Max Durtschi 103rd (+3:29.0, 2+2). Canada’s Scott Gow skied to 42nd (+1:36.0, 0+1). His brother Christian Gow placed 56th (+1:52.7, 0+1), Jules Burnotte skied and shot to 67th (+2:01.5, 1+0), and Aidan Millar 102nd (+3:26.4). Friday’s racing in Ruhpolding will feature a 4 x 7.5 k and 4 x 6 k relays for the men and women respectively. Anatasiya Kuzmina won the women’s 7.5 k sprint on Thursday in a time of 19:15.1 minutes. 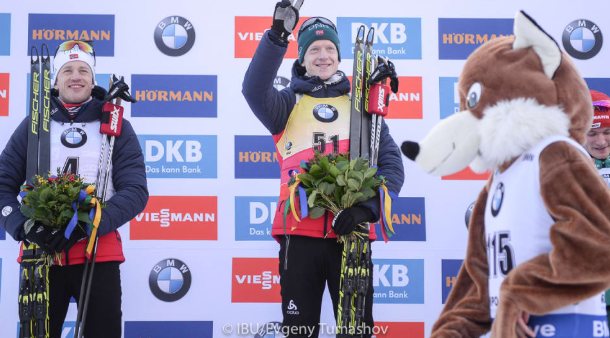 It was Kuzmina’s second win of the 2018/2019 IBU World Cup season. Kuzmina’s day was made a bit easier as she cleaned both her prone and standing shooting stages. Italy’s Lisa Vittozzi placed second 11.5 seconds behind Kuzmina. Vittozzi also shot clean. In third place was Sweden’s clean shooting Hannah Öberg. She finished 29.1 seconds back. Susan Dunklee for the U.S. placed 20th overall, 1:11.3 minutes behind with a single penalty. Teammate Clare Egan, placed 35th (+1.44.6, 2+0). Also for the U.S., Joanne Reid finished two places back in 37th (+1:45.2, 1+0). Rosanna Crawford was the top Canadian in 27th. She skied a single penalty loop to cross the finish line 1:32.3 minutes behind. Megan Bankes placed 68th (+2:32.7, 1+1), Emma Lunder 88th (+3:17.9, 3+2), and Sarah Beaudry 96th (+3:40.3, 1+3).